What will it take to stop extreme climate change? Birkbeck graduate Leo Barasi discusses his new book, The Climate Majority: apathy and action in an age of nationalism, which confronts the reality of climate change and the need for ordinary people to take action. You could look at the news and think climate disaster is now inevitable. Each of the last three years has, one by one, been the hottest on record. A consequence of that was visible with Hurricanes Harvey and Irma, which were made more destructive by oceans that had been warmed by human emissions. All of this has happened with the world only having warmed by perhaps a third of what it will this century if emissions don’t fall. But you could also look around and think the world is finally dealing with climate change. For the first time, global emissions have stopped increasing, not because of a recession, but because of efforts to deal with the threat. Nearly every country has committed to limit their emissions, in an agreement that anticipates national commitments will strengthen over time. Both views are right. Climate change is now here and is killing people. And the world is dealing with it more seriously than ever before. But which path will win out? Will the world eliminate emissions within a generation as it should if it is to prevent dangerous warming? Or will its efforts falter, emissions continue at their current rate (or even increase), and the planet respond with increasingly ferocious storms, heatwaves and droughts? My book, The Climate Majority: apathy and action in an age of nationalism, looks at one of the factors that could make the difference – and how those of us who are worried about climate change could swing the balance. While the world has done better than many predicted in halting the increase in emissions, its progress has depended on changes that have imposed little burden on most people. The most important of these has been the closure of coal power plants, and cancellation of new plants, which are increasingly being replaced by lower-carbon sources like gas and renewables. But eventually, the world will exhaust relatively painless changes like this. At some point, the only remaining emissions cuts – which will be crucial for avoiding dangerous warming – will be from activities that directly affect many people in their day-to-day lives. Two of the most challenging of these are flying and meat-eating. The world is going to have to radically cut emissions from both – but in the two areas, emissions look set to increase. Without action, either could effectively make it impossible for the world to prevent dangerous warming. Achieving these harder, but essential, emission cuts won’t be possible without public support. Yet, at the moment, that support wouldn’t be forthcoming. It’s not that many people deny climate change: no more than 20% do, even in the US. The more important problem is that many people, perhaps half the population, understand that climate change is real and a threat, but just don’t think about it very much and don’t understand why they would need to change their lives to deal with it. Without their support, crucial emission-cutting measures will fail. My book looks at the people who are apathetic about climate change and investigates why they think what they do. It explores how human psychology and the ways climate change is often described have made the problem seem distant, unthreatening, and a special interest of left-wing liberals. And the book looks at what we can do to overcome apathy. There’s no magic word that will make the world act on climate change, but there are ways we can persuade those who are apathetic that it is worth making the effort to deal with the threat. It’s still possible to tip the balance away from disaster. This post was contributed by Dr Sunil S. Amrith a Reader in Birkbeck’s Department of History, Classics & Archaeology. My recent book, Crossing the Bay of Bengal: The Furies of Nature and the Fortunes of Migrants (Harvard University Press, 2013) tells the story of a neglected region that was once at the heart of global history and which, today, is pivotal to Asia’s economic and ecological future. For centuries the Bay of Bengal served as a maritime highway between India and China, and then as a battleground for European empires—the Portuguese were followed by the Dutch, the British, and the French—shaped by the monsoons and by human migration. In the nineteenth century the British Empire reconfigured the Bay in its quest for coffee, rice, and rubber. Millions of Indian migrants crossed the sea in one of the largest migrations in modern history, to work on the plantations of Malaysia and Sri Lanka, and on the docks and in the factories of Burma. Booming port cities like Singapore and Penang became the most culturally diverse societies of their time. By the 1930s, however, economic, political, and environmental pressures began to erode the Bay’s centuries-old patterns of interconnection, and these were broken by the Second World War. The Bay fragmented as a coherent region in the second half of the twentieth century: it was carved up by the boundaries of nation-states; its histories were parceled out into separate national compartments. The postwar organization of academic knowledge drew a sharp distinction between the study of “South Asia” and “Southeast Asia.” But the recent resurgence of inter-Asian economic connections has seen the reinvigoration of the Bay of Bengal as a regional arena; and the force of the region’s environmental challenges calls our attention to the interdependence of its people. Historians have long been fascinated by seas and oceans, going back to the classic work of Fernand Braudel on the Mediterannean, the long tradition of scholarship on the trading links of Indian Ocean, and the thriving field of Atlantic history. Bodies of water can connect where land divides; putting the sea at the heart of our histories tends to emphasize mobility and interaction across the dividing lines of national or imperial borders. So often, the port cities of an ocean’s littorals are more closely connected to one another than to their own rural hinterlands. By foregrounding the region of the Bay of Bengal—linked by journeys, stories, and cultural traffic, and of course by the power of empires—we can see beyond the borders of today’s nation-states, beyond the borders imposed by imperial map-makers and immigration officials, to a more fluid, more uncertain world. But Crossing the Bay of Bengal shows that these connections were often coerced, often violent. Many experienced the fragmentation of the region in the twentieth century as a liberation, while at the same time, many minorities and migrant groups found themselves stranded, excluded and out of place in the new nation-states of the region. 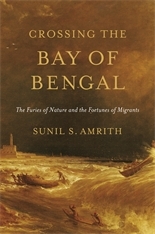 The research for this book took me all the way around the Bay of Bengal’s rim, from South India to Singapore, by way of Burma (Myanmar) and Malaysia, in a series of journeys made possible by the generous support of the British Academy and—in the last stages of the research for the book—a Starting Grant from the European Research Council. One of the key aims in my research was to tell the stories of those whose lives had been shaped by migration across the Bay, but who left little written trace of their experiences—the rubber tappers and dockworkers, the sailors and rickshaw pullers, whose labour made the Bay one of the most economically vibrant regions of the world in the early twentieth century. Finding an echo of their voices required a flexibility of approach, and a wide range of sources: my research took me to the archives of Singapore’s coroner’s courts, where the stories of very ordinary migrants emerged in testimony when things had gone horribly wrong; it took me to state archives in India, Malaysia, Singapore, and Burma, and—closer to Bloomsbury—to the invaluable collections of the India Office Records at the British Library. Oral history was essential to the research: over many years, conversations with elderly people in Malaysia and India about their memories of migration, their family histories, and their experiences of labour, helped to cast archival material in a different light. Two key forces have shaped the Bay of Bengal’s history, and they will be central to its future. The first is environmental. From the earliest times, the pattern of regularly-reversing monsoons made possible the Bay of Bengal’s trading routes: they were a source of life, and also of periodic disaster. In the nineteenth century, technological innovations including steam power promised to conquer the monsoons; but the monsoons asserted their enduring power over life and death in the great droughts that brought famine to the region in the 1870s and 1890s. Mass migration around the Bay of Bengal brought new sorts of environmental change to the Bay’s coasts, and made the region more interdependent. Today, the Bay of Bengal is a region at the forefront of Asia’s experience of climate change. The monsoons are less predictable than they were. Sea level rise threatens the Bay’s densely-populated coasts, home to more than half a billion people. While the scale and nature of these changes is unprecedented—and their causes are planetary in scale, rather than localized—history tells us that the Bay’s peoples have long coped with the furies of nature. One way they have done so is through migration over long and short distance, for short periods or more permanently. Migration is not, and never has been, an automatic or predictable response to natural disaster or to slow-onset environmental change: only where other factors are in place—government policies, the availability of credit, the presence of family or social networks in the places of migration—has it emerged as a viable strategy for family survival. Its long history of migration gives the Bay one of its most distinctive features—its astonishing cultural diversity, the mixture of peoples and languages that are evident to even a casual visitor. Migration around the bay is on the rise again, in a part of the world where mobility has not been exceptional but quite normal. The peoples of the bay are not strangers to one another. The triumph of narrow nationalism over more inclusive political visions need not be permanent. Notwithstanding conflicts over land and resources, the region’s past is animated by common spiritual traditions and expressions of solidarity across cultures. The bay’s history, as much as its ecology, spills across national frontiers. For more information, you can read two op-eds I recently published in the New York Times. ‘The Bay of Bengal, in peril from climate change‘, published on 13 October 2013 and ‘Snapshots of Globalization’s First Wave‘, published on 10 January 2014.